Wash the kale in cold water thoroughly. Then chop the kale coarsely. Cut the stems out if desired. Set the kale aside. Take 3 or 4 pieces of bacon and fry them in a pan until done to your liking. Take the bacon out and chop up. Set the bacon aside. If you want garlic, add the chopped garlic to the frying pan. Saute the garlic for about a minute, being careful to not let it burn. Add the kale to the garlic. Fold in all the kale until it has wilted down. Now, put the chopped bacon back into the pan and stir the kale and bacon together. Add salt and pepper to taste. And that’s it. 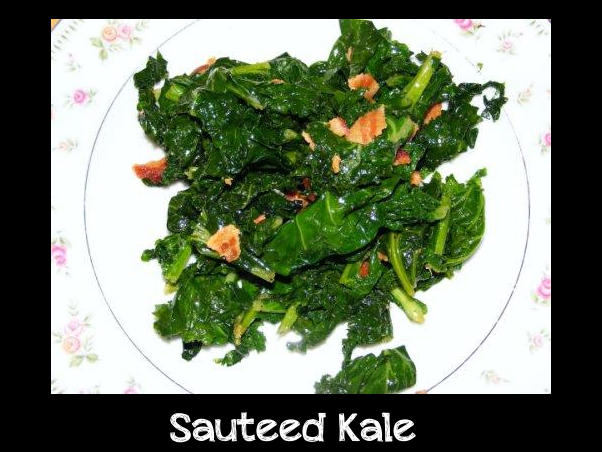 You are ready to eat some amazing sauteed kale. You won’t even believe how good this is for you because it tastes so delicious.